When it comes to mushroom toxicosis in dogs, it's often very difficult to confirm the type of mushroom ingested. That's because mushrooms are very difficulty to identify unless you're an avid mushroom hunter or a mycologist. That said, keep in mind that there are thousands of species of mushrooms in North America, with less than 100 of them being poisonous. When in doubt, never eat or trust a wild mushroom. Obviously, mushrooms sold in large-chain grocery store are safe and considered non-toxic to dogs (and humans). The best way of preventing mushroom toxicosis in dogs? Teach your pet owners to check their yard at least once a week (when poop scooping) to pull up any mushrooms that may be growing in the backyard. There are 5 main types of mushrooms that are poisonous, and they all work by different ways. • The most dangerous type of mushroom contains amanitin toxins, which results in severe gastrointestinal signs (within 6-24 hours), a “false recovery” period (where your dog appears to get better), and then severe liver failure (at 36-48 hours post-mushroom exposure). Kidney failure can also develop in the end stages. Examples of these types of deadly mushrooms include Amanita, Galerina, Lepiota, A. phalloids (death cap, death angel), and A. ocreata. • Another type of mushroom contains muscarine and causes profuse SLUDE signs (e.g., salivation, lacrimation, urination, diarrhea) and neurologic signs. They work somewhat similarly to the organophosphate and carbamates chemicals. Examples of these types of mushrooms include Inocybe spp. and Clitocybe dealbata. • One type of mushroom contains muscimol and ibotenic acid, and causes profuse signs like ataxia, sedation and even tremors or seizures. Examples of these types of mushrooms include Amanita muscaria and A.pantherina. • The false morel (Gyromitra spp.) causes profuse vomiting and diarrhea and is generally not fatal. Rarely, it can cause seizures. • Some types of mushrooms just cause gastrointestinal irritation (e.g., vomiting, diarrhea) and are rarely life threatening when ingested. Signs can be seen in 1-6 hours, and generally resolve after 1-2 days. These types of mushrooms include the following types: Agaricus, Boletus, Entoloma. 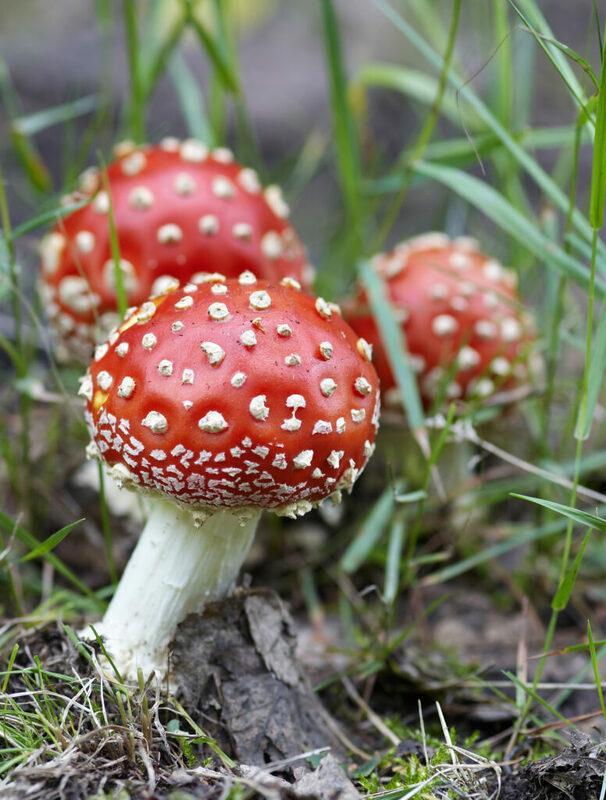 • Hallucinogenic mushrooms aren’t life-threatening and rarely need treatment. That said, signs of ataxia, acting abnormal, howling, nystagmus, and hyperthermia can be seen when dogs ingest them. These types of mushrooms include the following types: Psilocybe, Conocybe, Gymnopilus spp. Keep in mind that all mushroom ingestions should be treated. As mushrooms are difficult to identify, treatment is based on “worst case scenario” (just in case it is Amanita spp.). As a result, treatment includes inducing vomiting (if appropriate), charcoal administration (to bind the poison from the stomach and intestines), anti-vomiting medication, and depending on what type of clinical signs are seen, anti-seizure medication, muscle relaxants, atropine and symptomatic supportive care. When in doubt, contact the ASPCA Animal Poison Control Center at 888.426.4435 for life-saving advice 24/7. Here, two free publications from the ASPCA (based out of Urbana, IL) here and here.